Isn't it amazing how so many people come across our lives and teach us meaningful lessons, that help us in shaping our lives. We often miss expressing our gratitude to the unsung heroes who often teach us the greatest lessons of our lives. Say, for example, my first ever pet was a street side kitten, whom I had jointly adopted with my friend and sadly she couldn't survive more than a week, and hence two seven-year-olds got their first ever lesson on dealing with loss and grief at an age so malleable. Let's take a moment and look back in time, how many times has it happened, that you were taught an important lesson in the most unexpected ways. 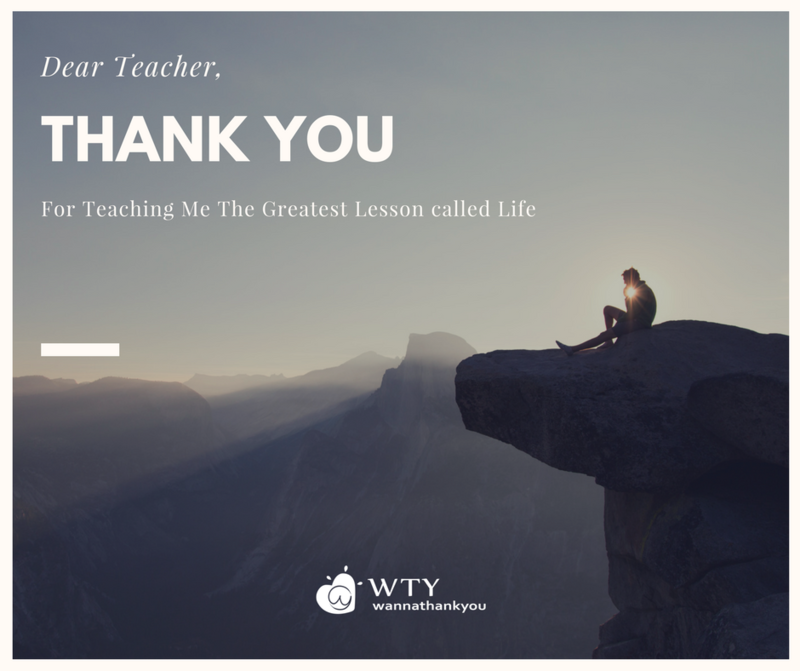 I am sure we have all had our share of learning beyond the four walls of the school but, how often do we remember to express our gratitude for the same? We are all so engrossed in making sense out of our lives that we totally forget to appreciate the good things that happen to us. For many of us, gratitude is difficult, and so is life. We have all had that feeling when the whole world seems to be throwing its worst armours at us and belittling our morale. Therefore, there has to be a constant and conscious effort to keep us reminded that if there is so much negativity in life, there ought to be a good deal of positive forces, that have kept us going so far. That's where it becomes important to nurture the “attitude of gratitude”. Joel Osteen wrote in his book-Your Best Life Now: 7 Steps to Living at Your Full Potential, “One of the main reasons that we lose our enthusiasm in life is because we become ungrateful..we let what was once a miracle become common to us. We get so accustomed to his goodness it becomes a routine..” A few days back I began to practice thankfulness. I would note down at least five good things that I had learnt throughout the day, and trust me! It has flipped my whole perspective on life. I have grown to learn that the more you allow gratefulness to take over, the more it helps you to live happily. So, how exactly do we express our thankfulness? Start with your closest niche, our family and friends. With a very conscious mind, try to think of the times when you were taught something worthwhile by someone who wasn't really a 'teacher'. At the end of this exercise will have a long list of people you would want to thank for different reasons. I wanna thank my friend who taught me how to ride a bicycle, the one who taught me the art of sharing when she passed to me her tiffin box when I had dropped mine, the one who stood by me and taught me how together even weaklings could fight bullies, and the list just goes on. Thank you all, for you have taught me the best lesson of and couldn't be thankful enough to you for all you have done! Few words of gratitude go a long way in keeping your mind healthy and your soul pleased. It's the acknowledgement of kindness with a simple 'thanks'. Who doesn't like to feel appreciated after all? The ones who foster an attitude of gratitude find tokens of appreciation every day, on their own. There are many ways to express gratitude, but for it to be effective, it has to be sincere and honest. It's easy to grab a few greetings cards from the shop, but a self-written note is what has the power to resonate in the heart and mind of the recipient. Therefore to get you started, we have brought to you WannaThankYou, the best channel to express your gratitude to the unsung heroes in your life who have helped you shape your life so far. Spare just one minute out of the 1440 minutes to thank that special person.